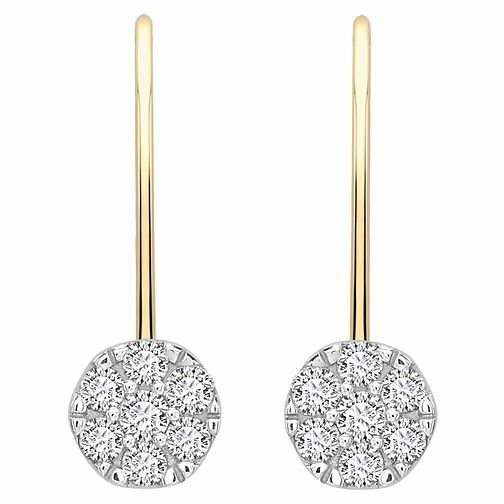 Sparkling with a cluster of diamonds each, these elegant 9ct gold earrings are designed to dazzle at every opportunity. Add a little glitz to your look. Be captivated by diamond clusters. 9ct gold fifth carat diamond cluster earrings is rated 4.0 out of 5 by 5. Rated 1 out of 5 by Anonymous from Very poor workmanship. Bought online. As I tried an earring on it fell into two pieces. I never even tried the second earring. Needless to say I returned the earrings and didn’t want a replacement. Rated 4 out of 5 by Anonymous from Good but do check that they have not been damaged. Overall a very nice pair of earrings and at the offer price worth the money, they have sparkle. The issue that I corrected myself was that the tiny spring loaded fastening around the back was not aligned properly and would not snap into place as it should therefore creating a risk of them falling out. I assume they are not made like that so they have been returned or poorly handled when packing them and bent the shape open too far. I would of been with in my rights to return them to be fixed but I did it myself as it was a Christmas present and didn't have the time to go through that process. Since then my wife has bought tiny plastic tubes to make them safer, they are very delicate around the back and could be easily bent out of shape, an extra mm of gold would of probably prevented this risk but she still loves them for their appearance. Apart from that I paid for gift wrapping and didn't recieve the earrings gift wrapped! I've shopped at Ernest Jones many times over the years and this kind of poor service is unusual, it might be that ordering over the Internet is the issue or a totally random event, I hope it is the latter for the sake of other customers who obviously will be spending a substantial amount of money for these gifts.